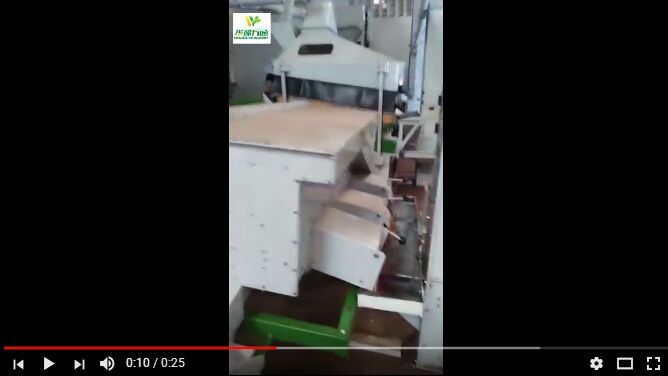 This bean cleaning machine or bean cleaning line is an automatic bean processing line integrated with cleaning, destoning, selecting, brushing, grading, color sorting and winnowing processes. The line is in double layer steel structure with equipments arrangement. It uses electric centralized control system, up to continuous automatic operation. This bean cleaning machine refers to the bean fine cleaning plant or bean fine cleaning line, which can process beans by fine cleaning with great efficiency and effectiveness. Compared with preliminary cleaning plant, it can help us get fine bean products. We offer bean fine cleaning plant to maximize performance and flexibility to suit your bean cleaning needs. All of our cleaners are precision cleaners with good sealing property and reliable performance. 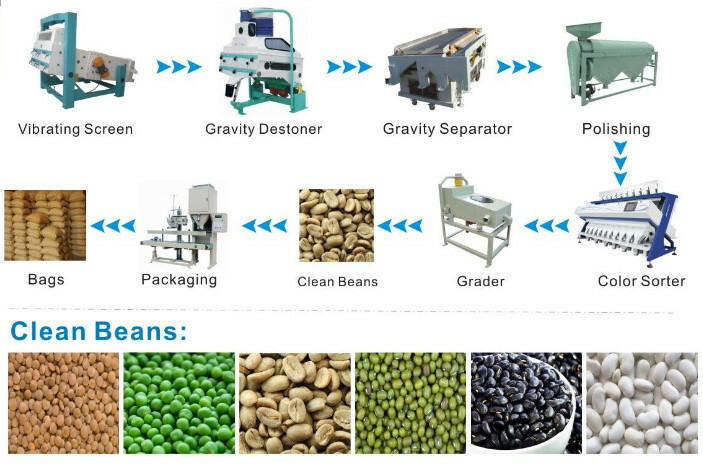 Bean fine cleaning machine can process various kinds of beans, such as soybean, kidney bean, mung bean, navy bean, sword bean, pea, cowpea, chickpea, butter bean, lentil, broad bean, black soya bean, small red bean and so on. The bean cleaning machine or bean fine cleaning line includes processes of once magnetic separation, twice cleaning and destoning. Materials are conveyed by elevators and 2 groups of aspiration systems are used to dedust. It includes 2 sifting processes to remove big and small impurities in the raw bean. Then the destoner fully removes the stones. The magnetic separator increases purity of the finished products to guarantee good taste by removing metal impurities so as to prevent them going into the final beans. Once selection and twice brushing processes lead to lustrous beans, increasing high yield, low brokens and uniform granules.After color sorting, the beans up to national standard can be packaged. Once selection process removes impurities in the bean; twice polishing processes dedust the materials to increase lustrousness;The vibration sifter grades out brokens in the finished products while the complete fine beans are conveyed to color sorter.The sorted kernels are selected again and then go to packaging cabinet. Finished products go to belt conveyor to be manually selected and then mechanically packaged through buffering bin. The project includes multiple groups of aspiration systems, meeting requirements for environment protection and reducing dust concentration. It also decreases noise in the workshop, guaranteeing secure and clean operation. It is equipped with overvoltage, undervoltage and electrical shock protection systems, making sure secure power supply.